WIP of a Rebel minis Irish gangster (pops) and a Khurasan Giant Ape (Skips) both with lots of ProCreate putty Additions! The paint job is about 1/3 finished on each. Here is my completed conversion of Pops for my Regular Show tribute crew! His body is a Rebel Minis Irish Gangster, the gun enhancements are bits of HO scale drain, and the head is ProCreate putty. I'm thinking about sculpting air hoses that mimic the shape of his moustache, but we will see how motivated I remain to try that. 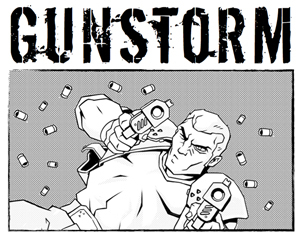 In other news, I have updated the Gunstorm rules a little, fixing a couple of typos and saving it as a 2 column PDF. It is located on its own page, acceded via the new button over on the right. 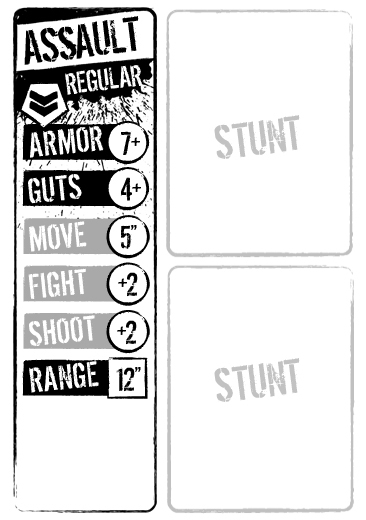 The combat rules are in a reasonable state now and ready to download from the links above. The rules have been written to fit into an 8 page pocketmod format so are quite brief. I don't bother explaining what a d6 is for example. cards will be ready soon. I have been testing with a simple scenario involving searching objectives, but I encourage you to swipe from Necromunda and ItEN scenarios, which are available for free if you google them. 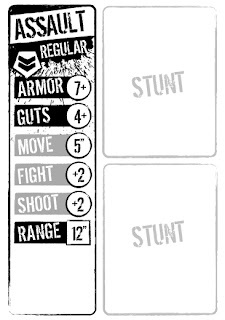 I am currently revamping the crew selection system to be entirely card based so you simply select a character type and two gear/stunt cards. This is to bring the game closer to a pure solo experience that is supported by special scenarios and eventually a campaign system. Please leave comments or questions!